Mission 2 Way Reflex Bookshelf Speakers. Made in England. Matched Pair. Great deal available on this one set only. Pre-owned but still in Excellent working Condition. You are purchasing a pair of usedMission MS-50 Bookshelf Speakers. There are no tears on the speaker grills. One of the tweeter cones is pushed in. There are a few light scratches along the edges and outter part of the speaker. TheseMission M71 speakers have been well taken care of and are in excellent condition. The speakers have been tested and have an amazing sound any audiophile would appreciate. Frequency response: 65Hz-20kHz, ±3dB. Beech wood finish. We cater to music enthusiasts and audiophiles, and we love what we do. We design audio systems for all budgets, from entry-level to high-end. We stand by our products. Driver Type mid/woofer driver, tweeter driver. These have been tested. Pair of Mission 700 "Leading Edge" Bookshelf speakers made in England in the mid 1980's. Two-way speakers with 25W to 75W capacity, 8 ohm nominal impedance, frequency range 55hz to 20khz. Mission 77 2 Bookshelf Speakers - Used . Very nice. And just the signs of used. shown in pics Looks great. For sale. 1 pair mission MS-50 bookshelf speakers.They are in good shape.There is a alittle ding on one side.As pictured.The grills are ok.
Mission 731i bookshelf speakers made in England in very good used working condition as pictured. Here's a pair of Denon SC-M5K 2-way reflex bookshelf speakers, made by Mission in England. Mission M31 Audiophile Black Bookshelf Speakers - Sound Great!! This is a great used pair of Mission M31 Bookshelf Speakers. These speakers have a black wood finish. They were engineered in the UK and made in Malaysia. The speakers have been tested and used and sound great. Mission Speakers. A matched pair. Model 700 - 2. Made in England. Speakers in excellent condition. Serial #s 908325 for the pair. Cabinets are solid with a few scratches and nicks. Sounds Great. For sale this mission speakers are In excellent condition. light scratches. Grille Color White. SPEAKER SYSTEM. SPEAKER SYSTEM DETAILS. We stand by our products. Driver Type mid/woofer driver, tweeter driver. Speaker Type speaker. DRIVER DETAILS (1ST SPEAKER). Signature is required. Enclosure type 2-way reflex. I have a pair of Mission Book Shelf Speakers Made In England for sale. They are pre-owned and have been tested and work fine. There are a lot of scratches and a broken off corner, see pics, but none of it affects the sound. Item has been used and tested. In great working condition. LOCAL PICKUP We promise to resolve your concerns quickly and professionally. Proceeds are used to support local programs and services. Pair of Mission 8 VET31735 Bookshelf Speakers England. There is typical wear and tear apparent on this item. Scuffing and scratches are generally present throughout. Will not affect functionality of unit. pair of high end mission bookshelf speakers made in england. they are in excellent condition. 1 grill clip broken but grills stay on just fine, great sound and power for bookshelf speakers.1 speaker works intermittently. No damage to cones may be loose wire. final sale with no returns but free shipping will be included. If you get the mix right, you are in audio heaven. If you flip through the pages of British Hifi magazines like HiFi Choice and What HiFi from that era, you will know what we are talking about. This was a highly rated speaker from the early Nineties. Pair of Mission MS-50 Two-Way Wired Bookshelf Speakers Nice condition. 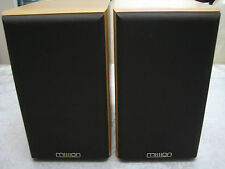 Pair of Mission MS-50 Two-Way Wired Bookshelf Speakers Nice condition.. Condition is Used. Mission Model 700 Series BOOKSHELF SPEAKERS 2-WAY BASS. Includes: 2x Mission Model 700 Series Speakers. Both speakers are in EXCELLENT WORKING condition. EXCELLENT - GENUINE . Make Supersized seem small. Get images that. Mission 70 ASA Subwoofer Grille Cover - Excellent Condition !! This is the original grille cover a Mission 70 ASA subwoofer. Excellent condition, all pins are present, no tears in cover ! Mission SX1 Bookshelf / Standmount Speaker Pair. Sweeping curves across every cabinet surface are there for a reason. As well as hindering the production of internal standing waves, each cabinet is constructed from a precise formula of interleaving wood layers, glued and pressed at high temperature for 48 hours and then left to cool naturally so that internal stresses are eliminated. Lot of 2 grills from a pair of Mission 731i speakers. No broken pegs or tabs. Grille Color White. Sensitivity 90 dB. -3dB Frequency Response 60 Hz. Frequency Response 60 Hz. We cater to music enthusiasts and audiophiles, and we love what we do. We design audio systems for all budgets, from entry-level to high-end. We stand by our products.